It is now possible to use (American) English as the default language in Potku. However, since the template is unique (designed for phpBB 3 by our user flammee from a template for phpBB 2), some of the key functions are available only in Finnish. UPDATE Aug. 23, 2009: The template has now been updated. This template is the work of egg. UPDATE Aug. 18, 2016: The template has been updated. In forum view, UUSI AIHE stands for Post New Topic, and in topic view, VASTAA VIESTIIN equals Reply To Topic. MUOKKAUS: UPDATE: Aug. 18, 2016: Using English will load the approriate buttons in English. Upon registering, you must first accept the terms in Finnish. It is the top button of the two in the bottom of the form. It says: "Hyväksyn ehdot ja olen vähintään 15-vuotias". Once you have clicked that, you will see the registration form in Finnish. Go straight to Kieli and choose English from the drop-down menu. After that, you are taken back to the registration terms page, but now you can read the terms in English. Read the terms carefully, and accept them if you agree with them. You will surely see the question there. After becoming a member of Potku, you can start topics and post replies in English as you wish. Most people here understand and speak English, so you will surely receive replies to your comments and questions. You can contact the administrators or the moderators for any reason at any time. They will assist you promptly. A quick look at the board and its forums will give you an idea what is discussed where. On the very top you can see five topics which have received posts most recently. - discussion area for the member of Potku co-operative (contact us if you are interested in joining the co-op). 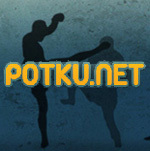 - a forum to review martial arts movies, books, DVD's, etc. - open forum for discussion about politics, religion, world events, etc. - a place to advertise new classes, seminars, workshops, etc. If you have any questions, do not hesitate to contact the moderators (ylipotkijat) or the administrators. Since various fora have been moved, intergrated, or removed, this is the current set-up. - discussion about martial arts sports like Judo, Boxing, BJJ, MMA etc. - discussion area for the members of Potku co-operative (contact us if you are interested in joining the co-op). If you have any questions, feel free to contact the moderators (ylipotkijat) or the administrators.